ASHLAND, Ky. — The Kentucky county clerk who was ordered to serve time behind bars until she agrees to issue marriage licenses to homosexuals has rejected a proposal to allow her deputy clerks perform the duty instead. 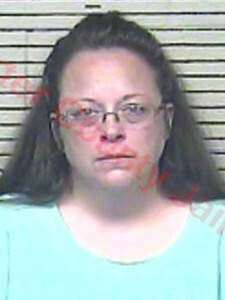 Hours after she was taken into custody and transported to Carter County Jail, attorneys for Rowan County clerk Kim Davis said that she would not authorize her deputies to issue the licenses under her authority. The proposal had been offered as a compromise to release Davis from jail. The six deputies under Davis appeared before U.S. District Court Judge David Bunning this afternoon, and while most showed reluctance to issue the licenses, five out of six ultimately told the court they would do so. The lone voice of resistance was Davis’ son, Nathan, who said it was not possible for him to participate because of his Christian identity. However, some of those who agreed to sign the paperwork questioned whether or not they even had legal authority to issue the licenses without the authorization of the clerk. Davis’ attorneys also expressed doubt over whether such a move would be legal. Bunning, a Roman Catholic, said homosexuals would have to take that risk, and stated that he would release Davis from jail if her deputy clerks issued the licenses instead. However, he said that he would not release Davis forthrightly because of his concern that she would put a stop to it and the matter would again be back before the courts. As previously reported, Bunning, appointed to the bench by then-president George W. Bush, declared Davis in contempt of court this morning after she explained in tears that it is not possible for her to comply with the order because of her Christianity. While the American Civil Liberties Union (ACLU) had requested that Davis be heavily fined until she bends, Bunning told the court that a monetary punishment would not be enough to force her to obey, and expressed concern that supporters would help pay her fine. Davis was then taken into custody by U.S. marshals and led out of the courthouse. “Thank you, judge,” she stated as she was being escorted from the room. Davis said that you can’t separate a person from their Christianity—it’s who they are and how they live. Davis became a Christian in 2011 after living apart from Christ in a sinful lifestyle that resulted in several divorces. She said in a statement earlier this week that it was her mother-in-law’s dying wish that she attend church, which led to her repentance and faith in Christ. Davis states that those who are now criticizing her are welcome to repent of their sin and be born again just as she did four years ago.